Atlas Genetics Ltd, the Bath, UK based, ultra-rapid Point-Of-Care (POC) molecular diagnostics company, today announces that it has received approval to CE Mark its Chlamydia trachomatis (CT) test to be launched on the Company’s io® platform. By meeting the requirements of the IVD Directive (98/79/EC), the CT test is now cleared for sale within the European Union. The launch of the io® CT test signals a new era in ultra-rapid molecular diagnostics. This is the first molecular POC test for a Sexually Transmitted Infection (STI) to enter the market, capable of delivering test results in just 30 minutes. With the speed and accuracy of the io® CT product, the testing and treatment of patients within a single, brief visit to the clinic now becomes a reality. The evaluations conducted on the io® CT test demonstrated that performance is equivalent to the gold standard laboratory test and will not be compromised by the transition of testing away from the central laboratory to the POC setting, or by the level of experience of the operator performing the test. The benefit of the io® platform is to provide a rapid result, delivered immediately to the patient which has the potential to improve patient outcomes, decrease onward transmission and reduce healthcare costs. 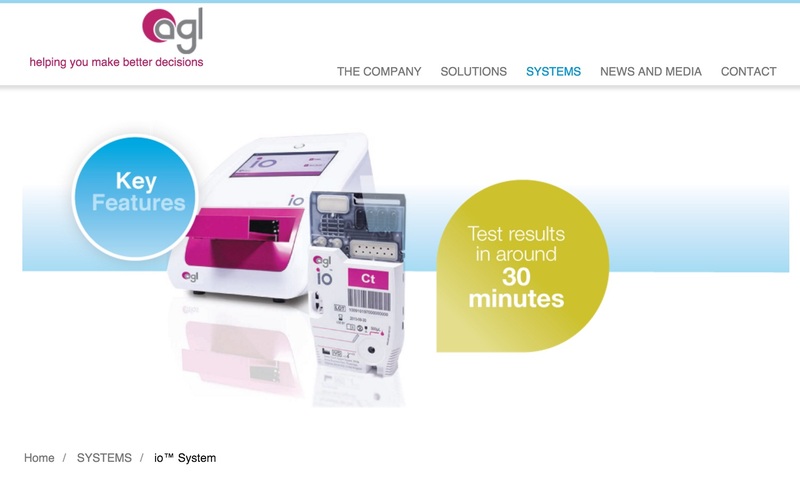 The Chlamydia test is the first in a pipeline of tests to be launched on the io® platform. Further menu development will include tests for Gonorrhoea, Trichomonas vaginalis and other STIs, for both the European and US markets. Whilst Atlas’s commercialisation strategy is initially focused on the area of sexual health, the io® platform technology can be applied in a wide range of infectious disease and oncology diagnostic test areas. Atlas Genetics develops ultra-rapid point-of-care (POC) diagnostic tests for infectious diseases. The Atlas Genetics io® system uses patented technology based on the use of a novel electrochemical sensor that combines speed, accuracy and multiplex detection capability. The Company has its head office and R&D facilities near Bath in the UK, with a commercial office in Boston, USA. Investors in Atlas Genetics include Novartis Venture Funds, Johnson & Johnson Innovation – JJDC, Inc., Consort Medical plc, BB Biotech Ventures, LSP, RMI Partners, Technology Venture Partners and private investors.